Have you ever heard of a suona, erhu, guzheng (all traditional Chinese instruments) ensemble with saxophone, bass clarinet, bass guitar, guitar and other Western instruments? 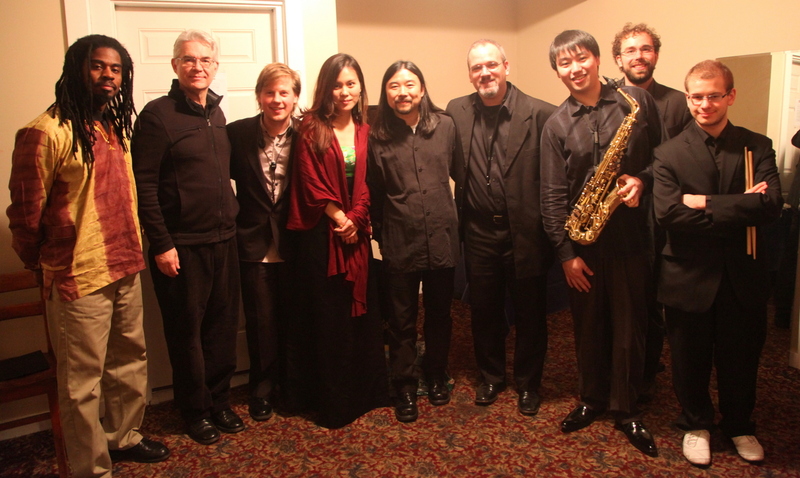 On the afternoon of January 29, 2012, at an historic site, the Regent Theatre, located in Arlington Center, a unique, East meets West, Chinese New Year concert was performed. The audience, (mostly non-Chinese), were entertained by China’s premiere suona player, Guo Yazhi and other local musicians. This concert was sponsored by the Frank Withey Memorial Scholarship Foundation a nonprofit 501(C)(3) corporation. According to the MC , president of the Foundation, Mr. Stanley Capernaros’ introduction, The Frank Withey Memorial Scholarship Foundation is committed to supporting the Arts as explained in the Mission Statement below. Offering scholarships to high school students who plan to enter Universityas a music major is one way the “Foundation” supports the Arts. Mr. Capernaros also expressed that by organizing concert events like the “Guo Yazhi and Friends”, the theme of this New Year’s Concert, is an important way to help the “Foundation” to raise funds. Yazhi Guo is a world famous reed instrument performer. He has served as principal suona player at the Hong Kong Chinese Orchestra for many years. In June 1998, U.S. president Bill Clinton visited China. In a reception dinner hosted by Chinese President Jiang Zemin, Mr. Guo used a saxophone to play the traditional Chinese piece “Reflection of the Moon in Spring”. He followed this by playing Western music using his suona, customized with the “living reed”, an improvement to the Suona, which he had invented. Mr. Guo receive high commendations for his performance from President Clinton and President Jiang. One of the performers that day, guzheng player, Hui Weng, graduated from the Central Conservatory of Music in China. She told reporter that Yazhi Guo, graduated from the same school as she, had been a great role model for her, and she truly admires his beautiful work and skills. She said that despite the busy performing schedule around Chinese New Year, she would not miss any opportunity to perform with this world class master. Jing Wang, a University of Massachusetts Dartmouth music teacher, performed on the erhu, as well as classical saxophonist extraordinaire, Yin Pei, from the Longy School of music, also participated in the performance. Conductor, arranger and saxophonist Dennis Shafer was the musical director of the program. This concert combined Chinese and Western musical instruments and together played “Fisherman’s Song at Eventide ”, “Jasmine Flower”, “Butterfly Lovers” and other folk melodies. Shafer’s soprano saxophone solo “Courting Ducks”, was written by composer Claudio Gabriele of Italy, captured and expressed a vivid and lively scene of ducks playing and chasing each other. After intermission, Yazhi Guo spent some time to give introduction of the history of Chinese instruments including the hulusi, suona, guanzi, erhu and guzheng. He also performed a piece of music using a simple ivy leaf, which truly amazed the audience. The last piece of the program was “Horse Race”, a traditional erhu melody, which allows the listener to imagine and feel they are part of one of the most exciting events on the grasslands of Inner Mongolia, galloping and racing Mongolian ponies. When the music stopped, the whole audience stood up, applauding and cheering. Under the warm cheers of the audience, Yazhi Guo again devoted himself to play a very difficult yet, passionate folk melody from Hebei Province, “Picking Dates”. He used the unique high tone of the suona, along with his profound artistic skill, and the virtuosic accompaniment by the other great musicians, to not only dramatically express the joyful scene of a harvest celebration among the Chinese country folk, but also brought the annual Chinese New Year’s festive atmosphere to a very appreciative audience.